Well, this weekend we went to our third and final (planned) car show of 2009. First we went to the Philadelphia Auto Show, then Washington D.C. and then Baltimore. Keep in mind, we went to the Frankfurt, Geneva and Paris auto shows in 2008 so we have become somewhat of Car-show snobs, and we saw most of what was new already. I had never been into Phili, just driven past it, so the auto show served as a good reason to go there. Also,we knew the new Nissan 370Z was going to be shown there so we decided to go. Out of the three auto shows we went to, this was by far the best. The 370Z was a little strange looking (as I mentioned in an earlier post) but overall, I like it and think it is a general improvement. We were able to see the 2010 Mustang in person (we had previously seen it on Motor Week) and I will admit it is much nicer in person than my initial impressions. Chevy had a significant showing in Phili with the ZR-1 and 4 new Camaros making an appearance. Best of all, the LS7 Camaro was there (in addition to an SS and two RS Camaros). The biggest deal was that they had an RS Camaro that was on the floor (Not behind a rope) WITH THE DOORS UNLOCKED. Pontiac had a 4-cyl Pontiac Solstice Coupe with 300hp (that is as much as our twin-turbo inline-6 BMW 135i). Dodge had the new Viper ACR (which just set the record for fastest lap by a production car) on display along with a list of comparison lap times. Not as big an "FU" as Nissan having the GTR Video on display opposite the Porche display in Paris, but still a nice touch. The biggest surprise was the Subaru Legacy Concept. WOW....amazing. The Chrome paint just made the car "pop" and the design was incredible. The LED Headlights, the camera side-view mirrors, the crisp lines. It looked amazing. There was one reason to go to the Washington, D.C. auto show. The VW Blue Sport Concept car. VW also had a TDI Cup Race car, and "Max" from the VW Commercials (the black VW Bug). In the area dedicated to the LeMans series, they had the Audi V10 TDI LeMans car and the Chevy Corvette E85 Race car. Electrics and Hybrids had a huge presence at the show, with Tesla making an appearance (our first sighting), GM had the Volt and the Saturn Flextreme on display (and some hybrid SUVs), Toyota had the new Prius and their prototype electric city car based on the IQ Concept from the european auto shows, Honda had their Hydrogen car and the new hybrid Insight, and Fisker had their two $100k+ electric sports cars (that look amazing). The display in D.C. wasn't quite as large as Phili, and the distance from the metro entrance to where we could enter the show was laughable (even though the entrance exit was right next to us, we had to make a lap of the conference center basically to get to the entrance). The high point was when we came across the rep from Summit Point Raceway in West Virginia. We are now on their email list once they release their schedule for their open track days (because that is the thing I miss the most about Germany). HA! Oh, how the mighty have fallen (at least in our eyes). We used to love going to the Baltimore auto show, and it was certainly much smaller than it used to be (Yes, I know, the economy is in the toilet, but still, it was sad). Chevy had ONE Camaro RS behind ropes, 1 ZR-1 and 1 Z06 Corvette. Eh...seen them all (in high quantities). Chrissy sat in the Z06 (the ZR-1 was locked). Ford introduced the new Ford Taurus (and also had the 2010 Mustang on the floor but still locked). They had some robot there for some kind of demonstration, but, meh.. 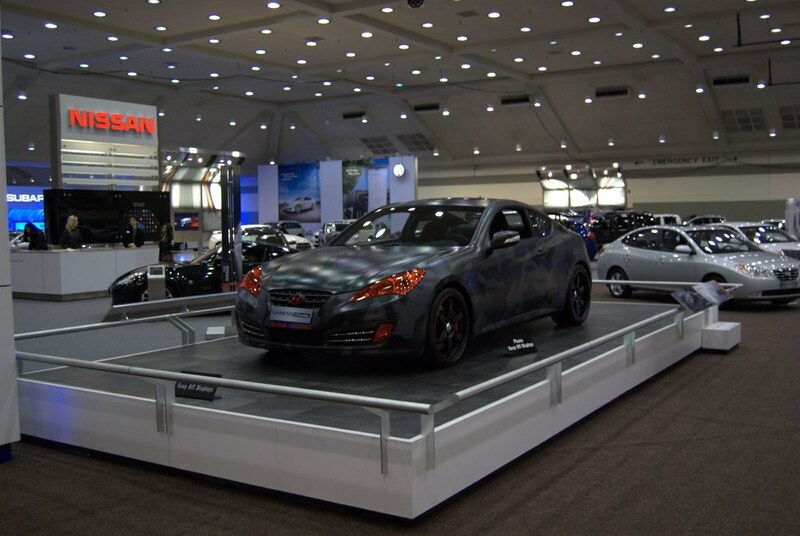 The biggest bright spot of the show was actually from Hyundai with their 2011 Genesis Coupe . Not only is the car hot to begin with, the paint job on there was AWSOME. It was grey camouflage with "Danger Intake" and "Danger Exhaust" stickers like a fighter jet. It looked AMAZING! Maybe sometime I will recap Frankfurt, Geneva and Paris.